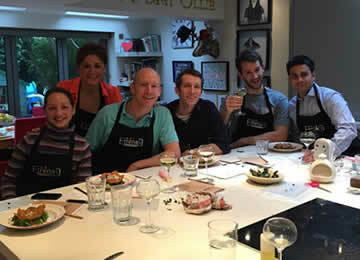 If you need a team building experience – Emma’s Kitchen would be delighted to help. Take your team of up to 20 people to a special evening at Emma’s kitchen. Drinks and canapes upon arrival where you will find out what you will be cooking. Everyone gets hands on experience of food preparation, cooking and presentation. You will all then sit down to eat and enjoy the meal you have prepared and cooked. It’s an ice breaker and a bonding experience for all members of your staff. It’s a fun evening with food, it unites your team and although they might start outside their comfort zone they will end up with comfort food and confidence. "A massive thanks for Friday which was a complete success from our perspective and exceeded all our expectations." "We all had an amazing time. Thanks you so much Emma’s Kitchen for a fantastic Christmas party. We will definitely be back for more next year."